Plants have been a passion of mine since childhood. During a trip to Los Angeles, agaves seemed particularly beautiful to me. Their gently curving leaves combine to create wonderful forms. When backlit or illuminated from the side, they can be absolutely stunning. When I found this agave, I knew that I wanted to photograph it. But the light right then wasn’t quite right. So I noted the plant’s location and returned very early the next day—at a time when the low angle morning sun would shine through its leaves from the back. The way that leave edges in particular were shining bring was very appealing, especially in contrast to the more subtle tones surrounding them. I came in close so that all visual distractions were removed. Because I was so close, though, my depth of field was reduced. This gave objects in the background of the image a softer appearance. 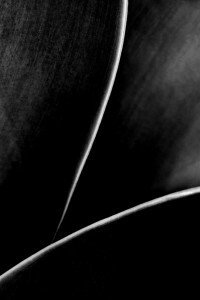 To emphasize those fine arcs of light and the shading in the leaves, I have rendered this photograph as black and white. In my imagination, the arcs seem like pathways in space. One great aspect of abstractions is that they welcome creativity. They provide the space for you to dream, for their shapes to be whatever your imaginative mind wants them to be.